This creature's Magic Resistance gives it a chance of resisting most hostile spells. The creature also takes less damage from spells that cause direct damage. All creatures have 50% of Magic Resistance, exept Gold Golem, which has 75%. 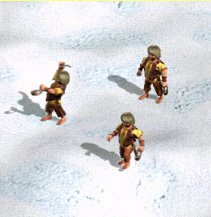 Dwarves have a 50 % of chance resisting any hostile spell, and take half damage from spell attacks. 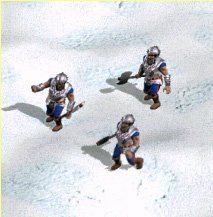 Comments: A slow but solid level 1 unit, when they finally reach the enemy (or more likely, when it reaches them), they can deal a fair amount of damage. 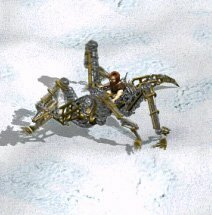 Giantslayer allows this creature to do extra damage to 4th level creatures. Halflings do extra damage against 4th level creatures. Comments: A weaker level 1 shooter, the halfling is great against low stacks of level 4 creatures when in high numbers. 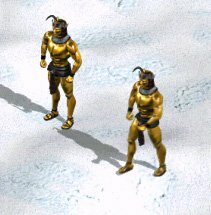 Gold golems have a 75 % chance of resisting any hostile spell, and take only 25 % of damage from spell attacks. Comments: A much better creature than the mage. 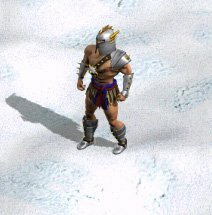 Having 50 HP (highest for a level 2) make it very difficult to defeat easily. If you think about turning to spells – don’t, as Gold Golems are also mechanical, and have 75% magic resistance. Spellcaster allows this creature to use a variety of spells during combat. The mage can cast the following spells: Blur, Curse, Magic Fist (4.8/Mage), Poison (2.4/Mage), and Raise Skeletons (1.6/Mage). Comments: A poor level 2 creature with rather weak spells. Ones that I use are poison, blur and magic fist. Its 16 (lowest for a level 2) hit points make it an easy target, as does its sluggish speed. Genies can cast the following spells: Cowardice, Create Illusion (18 HP/Genie), Ice Bolt (18/Genie), Mirth, Slow, and Song of Peace. Comments: Rather poor statistics, especially attack, but the Genies’ strength are in the spells. 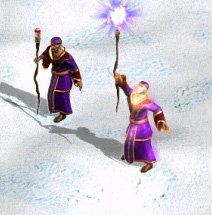 With a great array of spells including Ice Bolt, Song of Peace, and Create Illusion can devastate an opposing army. It is very cheap, too, only half the cost of a Vampire. This creature's No Retaliation ability allows it to attack without any chance of retaliation. The many-armed naga has a distinct advantage over other creatures, allowing them to attack with no fear of retaliation. 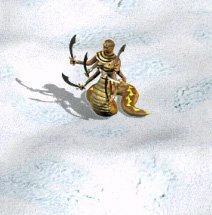 Comments: An average level 3 creature, the Naga possesses the always welcome no-retaliation ability. Taking into account the speed of the Naga, as well as its sizeable amount of HP, it would be a phyiscally strong creature to have. The reflexes of a dragon golem are tuned so tightly that their lightning fast attacks strikes before even the quickest enemy. They are built and manned by the mysterious, mechanically-minded Red Dwarves. Comments: With slightly higher ratings than the Titan, the Dragon Golem is a formidable adversary when it reaches the opponents, which doesn’t take long. It has an astounding 12 movement on the battlefield (and 9 speed), making it one of the fastest walkers. Chaos Ward makes this creature 50% resistant to Chaos spells, and its Melee and Ranged Defense is increased by 50% against Chaos-aligned opponents. 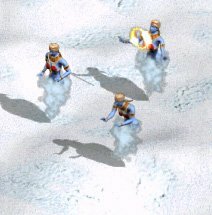 Unlike most ranged creatures, titans do full damage to adjacent targets. They are also resistant to Chaos Magic spells and take less damage from Chaos-aligned opponents. Has 50% magic resistance to Chaos spells. Comments: The third best shooter in the game is a fairly strong creature in its own right. Good speed, and the no-melee penalty set it apart from most shooters. The Titan is about on par with the Dragon Golem in a 1 on 1.